This is a great little coffee maker especially for the price the pods can be bought at the supermarket or on line. Bought this very good coffee maker for personnel use, easy to use, not taking up much space. Good range of top quality coffee. The pods are very small,just the right amount in each pod to make a good quality coffee large or small cupfuls. Lavazza coffee is the best and this machine works a treat. Small, simple and makes very strong and brilliant coffe. Its what you need for a great espresso at home. Brilliant little coffee machine. Small footprint, quiet and quick but most of all, excellent tasting coffee. Would definitely recommend without hesitation. 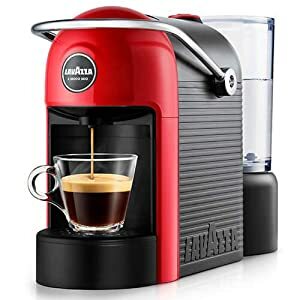 The lavazza coffee machine we had for nearly three years was looking the worse for the heavy use it had. This replacement is smaller, easy to operate and makes great coffee. The Lavazza Jolie Coffee Machine is the smallest and quietest of Lavazza’s A Modo Mio range. With a width of just over 12cm this coffee machine will fit in even the smallest of kitchens and you won’t have to raise your voice when it’s being used either as it only makes a whisperful 44db during the brewing process.One dose button gives a single espresso shot when pressed, a prolonged press can give a lungo measure until released.The bold and colourful Red Italian design features smooth, rounded lines and is extremely simple to use. 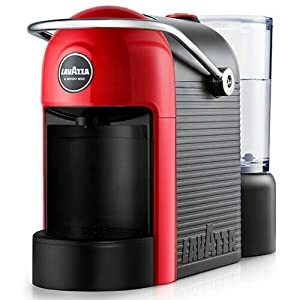 Fill up the removable 600ml water tank and insert a Lavazza A Modo Mio coffee capsule into the capsule compartment and close using the capsule loader lever.The coffee machine will be ready to use in approximately 35 seconds thanks to its Thermoblock technology. Place an espresso cup on the drip tray (or if you require a long coffee the drip tray can be removed to accommodate a larger cup).Press the illuminated button and the Jolie will start extracting your coffee using its 10-bar pressure pump. Press again when you have the desired amount (the Jolie will automatically stop dispensing coffee after 90 seconds).The used capsule is automatically ejected and the used capsule container is large enough to accommodate 5 used capsules. All removable components are dishwasher safe and to save energy the Jolie Coffee Machine automatically powers off after 9 minutes of inactivity.To set you on your way, the Jolie comes with 9 assorted Lavazza A Modo Mio coffee capsules. Coffee Machine dimensions: 12.5cm x 21cm x 33cm. Product is great value for money. Make a great coffee quickly and easily. Pretty quiet for a pod machine too. I’m told this thing makes decent coffee. It can take either lavazza branded coffee pods or 3rd party ones made by other companies. I understand that it’s possible to make your own pods, but not something we’ve tried. I can now confidently make coffee for people who drink it. Previously it was instant or make it yourself. Really nice and easy to use.